Poor indoor air quality, which has resulted in toxic mould lawsuits in the U.S., is a major “sleeper issue” for building owners in the United States and Canada, according to Erin Grossi, chief economist with safety science company UL. 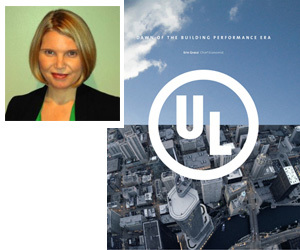 Grossi, who is presenting the findings of her white paper The Dawn of the Building Performance Era later this month at the Green Real Estate Conference in Toronto, said building owners have understandably spent the majority of their effort on energy, water and waste reduction but that air quality could take centre stage in the future. Her white paper research found a rising number of successful lawsuits around poor air quality. “Some of those that were winning; indeed it was workers who were in a building setting and developed some type of asthma-type symptoms and then brought cases against either the owners or operators of the buildings saying they were unduly harmed,” she explained. In UL’s white paper, Grossi said the recognition mould is a cause of human health complications has catalyzed an “uptick” in related lawsuits in the U.S. There are now more than 14,000 pending building mould cases and with juries awarding multi-million dollar settlements, building owners and their attorneys are actively looking for ways to protect against related problems. It’s estimated there are 80,000 chemicals in international use today, with only three per cent having been fully evaluated for health impacts. That is not currently the case in the States (or Canada for that matter). Grossi expects the issue of air quality will vault into public consciousness like bottled water did after people began talking about the downsides of putting water in cheap, clear plastic bottles. The devices could allow for the collection and display of live data on air quality in buildings and integrate that with dashboards that engage building occupants. It could be the topic of conversation, like outside temperature, pollution and pollen counts. “The only difference is most people would actually feel they have a fair degree of control over the quality of the indoor air, whereas outdoor air is a bigger challenge for any individual to impact,” Grossi said. UL estimates we are within five years of having robust and effective industrial and home detectors and monitors for air quality that can alert people when dangerous chemicals, allergens and particulate matter are present. That’s a game-changer, the company insists. “Once these products visibly hit the mainstream market, people will quickly forget how they lived in a world where they didn’t have access to information about the air they were breathing,” UL states in its white paper.